Posted on 08/23/2017 at 12:36 pm. Welcome to the Temple of Doom!! 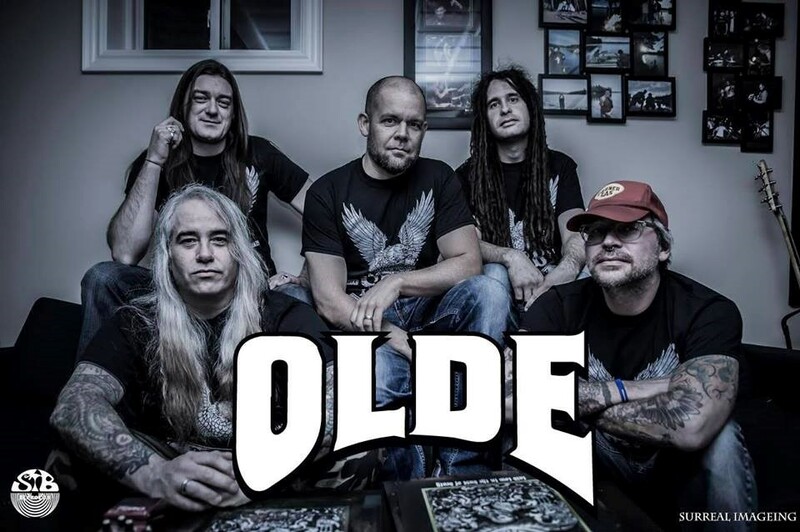 I just finished listening to “Temple” by a band from Canada’s Greater Toronto Area called OLDE. “Temple” by OLDE is the band’s 3rd album. With a focus on crushing riffs that has left me with ringing ears and a spinning head, I had to recover a bit before I started writing this review. Formed by guitarist/producer Greg Dawson who was inspired by a recording session with long-time stoner metal stalwarts and bandmate in Sons of Otis as well as friends in Moneen, Jaww and Five Knuckle Chuckle, Dawson (Cunter, Grift, BWC Studios) handpicked and assembled OLDE. I loved what I heard on “Temple” but I wanted to hear what OLDE’s past work sounded like to get a better feel for the band. So I cued up their 1st 2 albums as well as “Temple,” turned out the lights, put my headphones on and had myself a musical feast. What I liked most about the music in general is how the band focuses on crushing heaviness and the almighty power of the riff with bellicose vocals and sludgy bass and heavy handed riffing . Yet the music isn’t just a bunch heavy riff and growling vocals. Just like OLDE’s previous albums – “Shallow Graves” and “I”, “Temple” has tons of meat to it. Besides the amazing guest solo on ‘Castaway’ done by Joshua Wilkinson, and the stunt guitar work of Ryan Aubin on ‘Maelstrom,’ “Temple” is full of intense leads and hooks. Some of my favorites are ‘Subterfuge’ and ‘Now I See You’ which both have some killer riffs with drums by Ryan Aubin that sound positively tribal. The album’s title track “Temple” is an ominous bass heavy doom masterpiece that highlights the vocals of Doug McLarty. “Temple” was recorded mixed, mastered, and produced by Sons of Otis, guitarist/producer Greg Dawson at BEC Studio with album art by Joshua Wilkinson. The album also features a guest solo on ‘Castaway’ by Simon Talevski and a stunt solo on ‘Maelstrom’ by Ryan Aubin. “Temple” can be purchased as a Limited Vinyl LP on Bandcamp through STB Records, Limited Edition Cassette via Medusa Crush Recordings and in digital format on OLDE’s Bandcamp page.